Help save Auridon from the Veiled Heritance and their Daedric allies. Firsthold — Save Firsthold from the Veiled Queen. 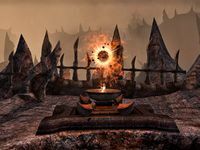 In order to save Firsthold and all of Auridon from High Kinlady Estre, the Oblivion portals must be closed and Estre defeated for good. Enter the first portal and destroy the sigil stone. Enter the next two portals and destroy the remaining two stones. Find and talk to Razum-dar. "Estre is vulnerable. But Tamriel is still open to the Deadlands. This must not be. We must close her gates. End the threat of the Daedra." How do we close the gates? "Each gate is maintained by a sigil stone. Enter the portal, find the stone, and destroy it. Raz is going to guess they will be guarded." So I should be careful? "Just so, my friend. Good luck in there. Raz will rejoin Urcelmo and the others. Ensure Firsthold is still here when you get back." North of you will be an Oblivion gate to south entrance of The Refuge of Dread. Follow the tight path, defeating Dremora along the way until you reach four braziers on the corners of a ritual circle. Light these to remove the barrier preventing you from progressing further. Behind it is a Sigil Stone. Destroy it to close the portal. You will find yourself in the closed gate. Go north into the Firsthold Courtyard to find Dremora and marines fighting. There are two more portals to the northwest and northeast, also leading the Refuge of Dread. The Northwestern Gate enters the Refuge of Dread, perhaps unsurprisingly, at the northwest. Again, you will follow a tight path, defeating Dremora. The obstacle to the Sigil Stone this time will be a Clannfear minor boss called Marrow. The Northeastern Gate enters the Refuge of Dread at the northernmost entrance. Yet again will you follow a tight path and fighting Dremora. The Sigil Stone is guarded by Mezelukhebruz, a Spider Daedra. "The gates are closed. And Tamriel is just a little bit safer. What do you say we put an end to Estre?" "He and Sinien are already inside. We have one more portal to close. The High Kinlady Estre clutches to Dagon's robes. Hides within the Deadlands." Will you come with me, Raz? "It would be Razum-dar's pleasure to fight by your side. Follow. He shall lead the way." Razum-dar will then open and enter Castle Firsthold, where he, Urcelmo, and Sinien enter the final gate to the Refuge of Dread. You will find yourself at the eastern entrance. This is the only section of the Refuge of Dread that is not a tight passage, and you will be walking on an island in the middle of a lake of lava. Go west to fight Kinlady Estre, who will twice summon flame atronachs to cast a protective shield around her. The trick to win the battle with Kinlady Estre is to destroy the flame atronachs first. You may notice that your attacks on Estre have minimal, if any effect while the flame atronachs exist. Unlike in other battles, if you are killed the remaining beings do not regain all their life force, so keep going. When you finally finish Kinlady Estre, Razum-dar, Sinien, and Urcelmo exit the arena via a portal, leaving you to destroy the sigil stone before you leave. "Estre dead. Rilis found. Razum-dar couldn't have asked for more. Even this one must admit: you do good work. Without you leading the charge, today could have gone very differently." "Queen Ayrenn has arrived. She is just outside, with her retinue. This one is certain she'll want to hear your report. Go. We will speak again soon." Ayrenn is south of the castle and surrounded by First Auridon Marines. "The Battlereeve tells me Estre is dead. I mourn her loss. She is the past. And you, our future. Your service to our people has been exemplary. You have proven yourself a valuable asset to the Aldmeri Dominion." "Among those who heed my voice, you will be honored and welcome. Our alliance of three peoples is fragile but beautiful. With you at its heart, I'm certain the Covenant and the Pact will learn to fear the eagle's cry." I should enter the Oblivion portals and find the sigil stones that power each one. 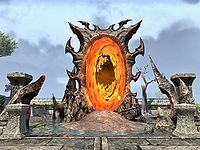 Once I find a stone, I will need to destroy it in order to close that portal for good. I've closed the portals. I should speak to Razum-dar. I should enter the castle. I should enter the portal to the Refuge of Dread. I should defeat High Kinlady Estre and end this madness. I should speak to Razum-dar and let him know what happened. Finishes quest I should speak to Queen Ayrenn. This page was last modified on 6 December 2017, at 16:14.